Mmmm. . . a “grown-up” version of mac and cheese? When I saw the ingredients in the recipe, I knew my family would love it. 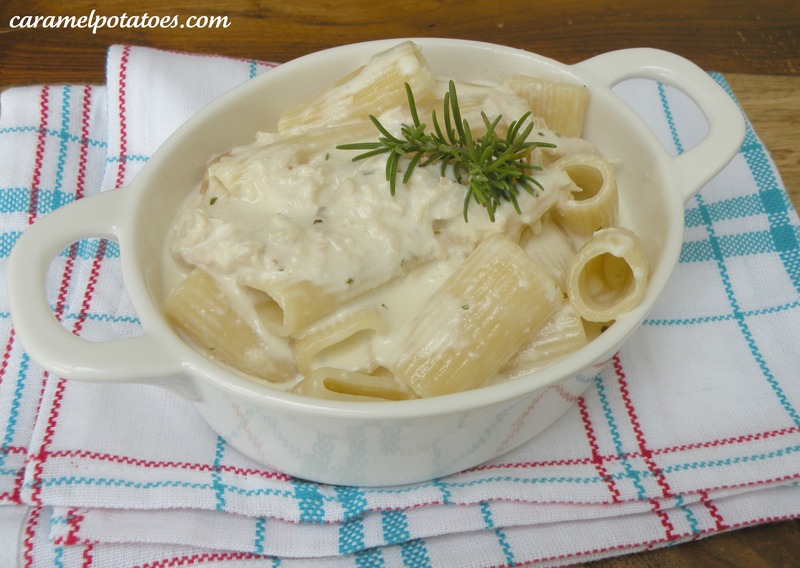 Rich and creamy cheese sauce with rosemary over chicken and pasta – it’s a delicious combination! Even though the name of this recipe is quite long, it’s really a very fast and easy meal- perfect for busy nights or summer nights when you don’t want to turn on your oven. Pair your pasta with a salad and bread sticks and enjoy your dinner! 1. Place a large pot of salted water over high heat and bring to a rapid boil. Add the oil and rigatoni to the water and cook according to the directions on the package, 10-12 minutes. 2. While you are waiting for the water to boil, pour the cream into a large sauce pan over medium heat. Add the rosemary and garlic to the cream and bring it to a simmer – take care not to let it boil over. Allow the cream to reduce by about half. 3. Stir in the goat cheese and chicken and continue cooking until the cream coats the back of a spoon. 4. Thoroughly drain the pasta. Add the pasta to the sauce. Coat the pasta in the sauce and simmer over low heat for a few minutes. Serve hot.